We live in the southeast of Lower Saxony in a small village in the district of Helmstedt. The surroundings are nothing but pure nature – ideal conditions for long and active walks with our Akitas. 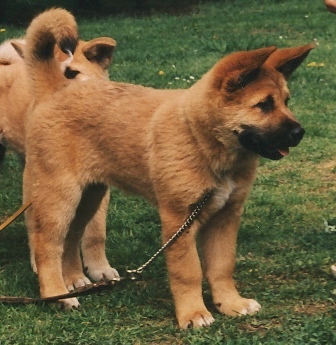 In May 1987 the first Akita, a red male named „Erebor`s Limba”, aged 3 months, cameto live with us. We soon found out that the owner of Limba`s sister Rana, named Ingrid Stahl, lived in Großmoor which is only about 100 km away from us. So, as you can probably imagine we spent a lot of weekends there. Ingrid was very knowledgeable about Akitas and so she was in a position to give us a lot of helpful tips. 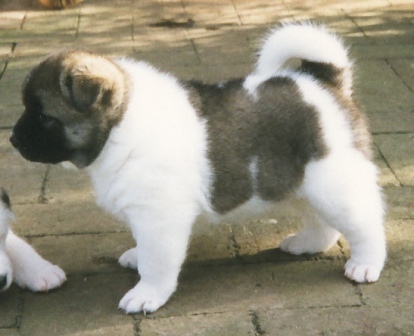 The most important thing here is that you have to start with the up-bringing of the Akita from day one, as you cannot underestimate the Akitas inclination towards dominance and hunting. In addition to this, the stubbornness of the Akita demands a lot of patience and empathy. To teach Limba where his limits were, Klaus went to a dog school with him and as a result they both passed the “companion dog”test. Looking back we have to say, this was the best decision since Limba had an enormous self confidence and a very strong instinct for hunting. Our enthusiasm for this breed was now unstoppable. 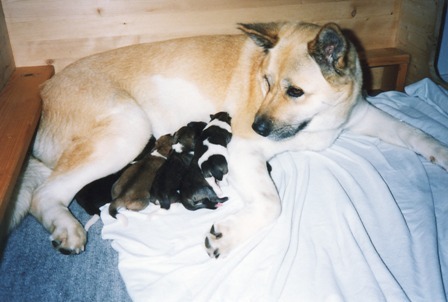 In January 1989 Ingrid had her first litter of 4 puppies. A small female named „Ajia von Nobara Ken“was reserved for us and joined our family when she was 10 weeks old. In the same year we applied with the FCI to register the international kennel name for our kennel – “von Kobushi-Ken”. After Ajia fulfilled the breeding conditions and a suitable stud dog was found in the Netherlands, there was nothing to stop us from starting to breed. In the following two years Ajia had two litters, whelping 6 puppies each time. The upbringing of the puppies in our house and garden was an interesting challenge. At the same time it wasn´t an easy task for us to find suitable buyers for our puppies. We felt it was very important to keep close contact with the new owners after the puppies were in their new homes. Many friendships developed because we kept in touch, some of them deepened and still exist today. In 1994 Richard Hellman, the owner of the well known Italian kennel “no Shatsuko” offered a puppy to us. She was the daughter of the imposing and very successful Akita male “Seihoh of Juntaidoh”. Her name was “Mitsubaki go no Shatsuko”, but we called her “Taru”. This puppy had the most characteristic traits of its breed that I had ever seen. Taru developed wonderfully and Klaus found great pleasure in participating in exhibitions resulting in Taru winning the title of “Deutscher Champion VDH”. Unfortunately, our wish to breed with Taru could not be fullfilled as she had huge hormone problems. The most important thing for us was that our three Akitas got along very well with one another until the end of their lives. No matter where we went, we always took them with us, even on our holidays. They behaved very well in hotels as well as in restaurants. In 1996 I passed my exams as a special judge for the Akita and continued my training for 23 more breeds (sled dogs, hunting- and herding dogs, as well as three more Japanese breeds). For more than 20-years we have done voluntary work for breeding clubs within the VDH, occupying a variety of functions. Klaus worked as a breeding supervisor and treasurer of the executive committee. For many years I was very busy working as secretary of the ring and specialist at exhibitions. I was also assigned to the post of breeding supervisor and worked as part of the managing committee, first, running the branch office and later on as breed-supervisor for the club. I often participated in educational programs / events with the VDH and acquired a sound knowledge of cynology. 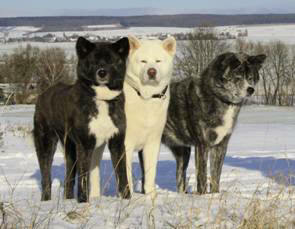 At present we have three Akitas, 1 male and 2 females, are living with us and our desire to breed again has been kindled. Our goal is to breed healthy, socially acceptable Akitas of good character, which come close to the ideal standard. We would like to thank this breed for all the friendships, contacts and conversations with interesting people around the world. If your interest for this breed should be aroused, all you have to do is contact us. We will be happy to arrange a personal meeting – you are welcome as guests in our house. Should you need further information about this breed, feel free to contact us via e-mail or phone. We shall be only too happy to help you.